I'll be heading out of town for a conference next week. I'll be sharing posts from the Q&A archive so you might see something you haven't seen before! Question: I was wondering if you could offer any more details on how to revive dried sphagnum moss? and how would I know if what I have is even capable of regeneration? Answer: Most of the dried moss you find at craft stores is a form of dried long fiber sphagnum moss. These dried vine-like tendrils sometimes, but not always, contain the dormant live sphagnum moss. You can check for the live moss by looking for the "crowns" of the moss- which look like a small clover blossom. These crowns are a good indicator of a chance at sprouting the moss. To propagate the moss you must provide a humid temperate environment with a decent amount of air circulation. This can be achieved in a bottle terrarium, a plastic take out containers with a few holes punched in the top or even large plastic bins with open tops. People all seem to have their own secret for success- a grow lamp or a partial submersion in standing water or even seaweed sprays. Watch for the appearance of mildew, spidery webs or algae. If it's a small bit you can remove the offender but if it becomes expansive its best to start over with clean containers. I have found that you can experiment with light levels and moisture levels- but you do need to stay patient. 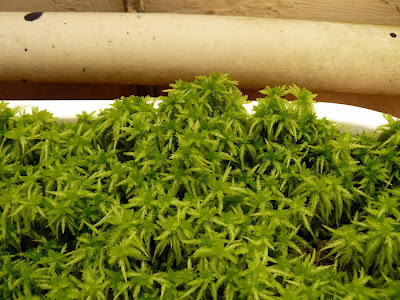 Sometimes it can take the live sphagnum moss a few months or more to revive. But once it becomes a bright green you know you are working with the live stuff. Once it becomes a healthy darker green you can switch it over to growth on a soil substrate. Under the proper conditions and given enough time it can fill out to get the mossy miniature "grass" appearance.